The archivists amongst you may have read about the latest updates from our post fire recovery project in ARC, the Archives and Records Association’s monthly magazine. 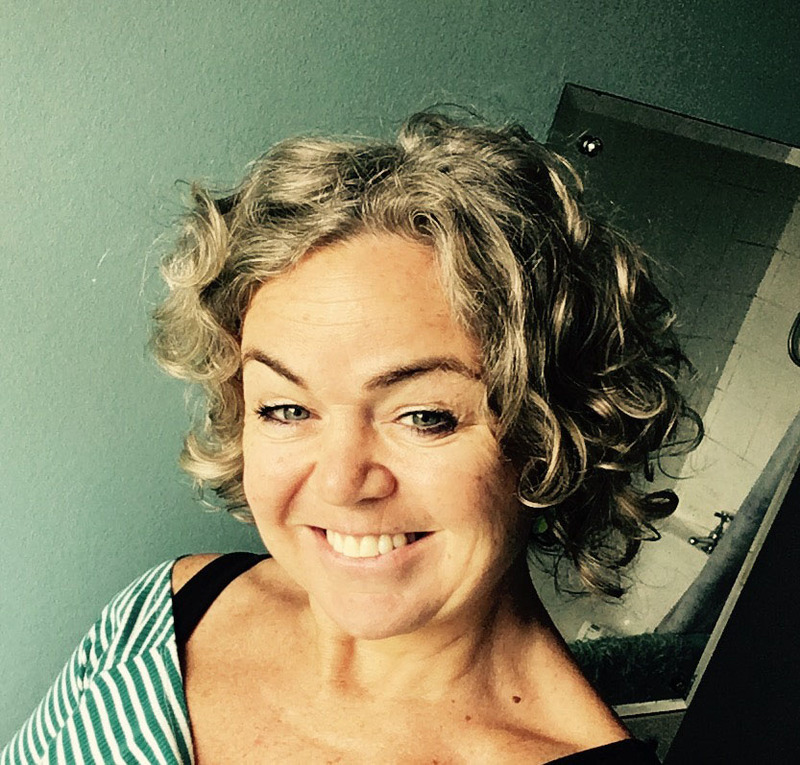 For those that didn’t see the article, here’s our Recovery Project Lead Polly Christie to tell us more! 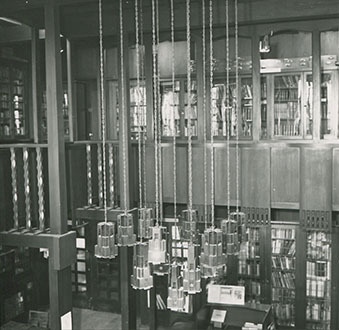 Glasgow School of Art’s Archives and Collections, comprising the school’s institutional records, deposited archive collections, textiles, plaster casts, artworks, architectural drawings, objects and furniture, were housed in the Mackintosh Building at the time of a devastating fire in 2014. My colleague Susannah Waters wrote an article for ARC a year after the fire about the immediate evacuation, triage and drying of the collections. In this piece I’d like to bring you up to speed with progress since then. Very early on, we needed to confirm the losses and damage to the collection, as well as the anticipated costs for recovery and conservation, in order to reach a settlement with the insurer. For some areas of the collection, this was straightforward but in other areas, the collection was virtually inaccessible or distributed across the country, requiring innovative, remote and theoretical approaches to the appraisal. At this stage we were also being inundated with enquiries from GSA’s Restoration Project team and the architects who were preparing to restore the Mack. Never could we have anticipated the use to which the archives would be put in the aftermath of the fire! Comprehensive records of the governor’s, secretary’s and treasurer’s meetings enabled the researchers to pinpoint changes and modifications to the building; inventories and receipt books informed them of the composition, quantities and suppliers of materials; the photographic collection proved invaluable in identifying lighting mechanisms, clocks, layouts etc. However, although unaffected by the fire, the archives had been moved and piled up in a warehouse outside of the city, rendering these enquiries extremely challenging! However, the Archivist and Curator’s knowledge and versatility enabled a listing to be produced, and a mini-reference collection assembled on site for interested parties. Life became easier when we managed to secure space in The Whisky Bond, a creative hub just north of the city centre. This was a turning point, as it allowed us to re-assemble the collection, re-organise the materials and crucially open the service back up to the public. 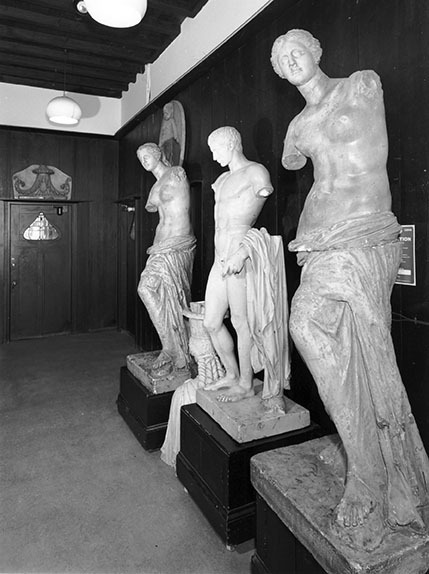 Conservation began as soon as our budget was approved, the immediate priority being the plaster casts, as most of them were housed in the Mackintosh building and in the contractor’s way. The small casts were moved off site, while the large casts were strapped up and boxed so they could be manoeuvred out of the way on pallets when required. Following conservation trials and stabilisation, eight damaged casts were moved off site to the conservator’s studio, but three were too big and fragile to move, so were treated on site. Not ideal, but the contractor’s appreciation of the collection’s significance countenanced this flexible, if unprecedented, approach. 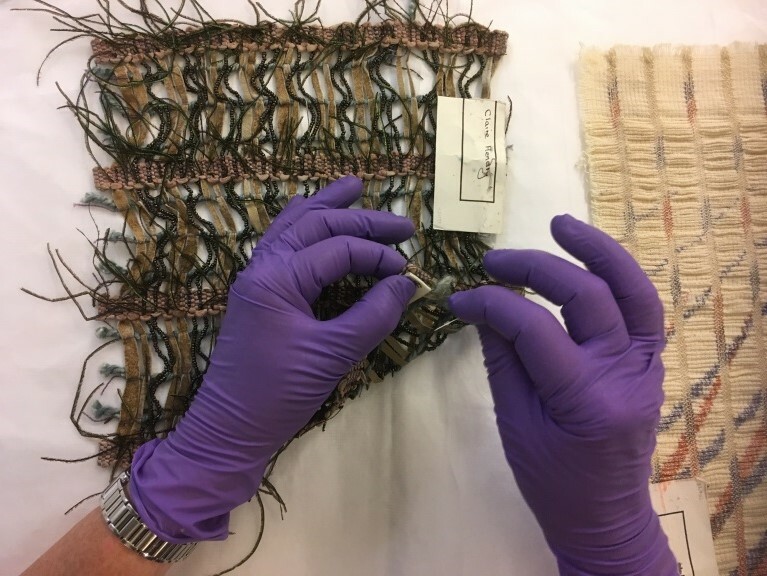 Textile re-packaging was the next priority, as, while the collection itself survived the fire, all the packaging was destroyed by water, meaning the collection had been largely disassociated from its ID numbers, and inaccessible, piled between sheets of acid-free tissue! Following a detailed reordering and measuring exercise, followed by research and consultation into the latest storage solutions, the textiles are now well on their way to being back in an accessible state. The remaining conservation and re-packaging of paper, object and furniture has been scheduled to take place in 2018 and 2019. Casual staff sewing labels onto each item in our textile collection to make the pieces more easily identifiable. Another major activity this year has been a review of how we manage our data. The experience of the fire and subsequent lack of physical access to the collections, coupled with the increased interest therein, honed our thoughts and reliance on the various systems that we use to track, catalogue, publish and manage the collection. With this in mind, we began a comprehensive review of available archive management systems, and have kick started a migration project which will enable us to rationalise all our data into one system. This will not only improve our service to users, but will prove essential as we plan and manage the big move back into the Mack in 2019. Meanwhile, art education, the School’s primary purpose, goes on, and despite the conditions, the events of 2014 have reinvigorated the interest in and potential of the archives and collections in teaching, learning and research, resulting in the archives and collections attracting ever-growing numbers of visitors and enquiries. To stay up to date with the Recovery Project, see our blog at gsaarchives.net/blog.